Square Enix has announced that its hybrid first-person shooter and card battler Deadman's Crosshas crossed the million download threshold in just 11 days worldwide. Similar at its core to collectable card games (CCGs) like Rage of Bahamut, Deadman's Cross draws heavily on the always-ripe genre of zombies and combines standard card battling with a full 3D FPS overworld map. 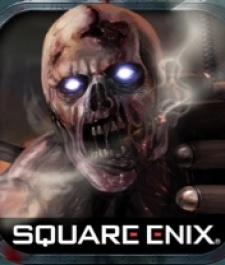 This infusion of novel gameplay undoubtedly helped Deadman's Cross stand out from the pack of free-to-play card battlers on the App Store and Google Play - as did Square Enix's name - but the million global downloads number might not be as glowing as it appears. According to App Annie's data, Deadman's Cross has captured the #1 position for RPGs in 71 countries while it's held the top spot for Card games in 89 - yet many of these prime positions come from smaller markets like Montserrat, Croatia, and Bhutan. That said, Deadman's Cross has found some strong success in larger, western markets - principally the United States, where it peaked at #1 in the Card category and #3 in Role Playing. In the UK, meanwhile, Deadman's Cross' success is more modest, peaking at #8 in Card and #10 in RPG. To celebrate the 1 million download milestone, Square Enix is giving away 300 Deadmans' Coins to players who download and register Deadmans' Cross by Friday 28 February. Bonus rare item code: F8MZSSX Â— Gives you extra rare cards at level 5! You will obtain a free 3 star card upon hitting level 5. I can also send you 4 star cards if you add me in game and tell me. You have to hit level 10 to receive the 4 star cards though. I will be really grateful to you and you will make me incredibly happy if even just for a silly game. Bonus rare item code: 4192L7M Â— Gives you extra rare cards at level 5! I canÂ’t get enough of this game. ItÂ’s totally addicting! Note: This code will give you a HUGE advantage early on, so don't use it if you want to play the hard way!